The Heritage Foundation, like most US organisations which can accept tax-deductible donations, is in the last stages of their end-of-year appeal. This is an important time of year for such US organisations as it is the end of the tax year for donation purposes, just like in Australia at the end of June when our tax year ends. Of course, being an Australian, I’m not eligible for any tax rebate for donating to a US organisation. Like most organisations, Heritage is flooding supporters with email requests for donations, and including a link to the donation form on their website. Unfortunately this form has a bug which causes it to not handle transactions involving non-US credit cards properly. The transaction will succeed, but the page will claim it was declined and advise you to check the address you entered. It wasn’t until the third attempt that I worked this out…so yes, silly me did just give them triple the donation I meant to give. The good news is that Heritage believe they can reverse the unintended payments…but not until Monday morning their time when some of their senior staff are back on deck, and by then I figure it will cost them extra in fees because my bank will have finished processing the payments, so I won’t bother and instead will just not donate to them for a while. I will call them back on Monday to make sure their senior staff are aware of the issue though. So, if you’re using a non-US credit card and want to donate to The Heritage Foundation, their website buries a contact number ((800) 546-2843) and a link to a PayPal page (to which I won’t link…if you want to use it, go via the above link to the Heritage website rather than trusting a direct link to PayPal from my site) half way down an FAQ page. If only I’d seen that earlier. Meanwhile I was also going to donate to Hillsdale College’s end-of-year campaign, but their website doesn’t accept non-US postal addresses (due to the same problems which Heritage have, perhaps?) and they have to be called by phone. Unfortunately they went home before 5PM eastern time, so that will have to wait until next week. I did, however, donate to the Institute Of Public Affairs‘ end-of-year campaign (although why they have one at the end of the year, apart from it being a nice date, escapes me). It is nice to start 2015 on a conservative note by supporting these organisations, even if it is requiring more effort than I was expecting. I have a lot of photos and a few stories to share about my time in Las Vegas (which comes to an end this morning) and not enough time to post them right now, but before I leave Las Vegas I would like to share this. On Wednesday afternoon I went out to the Green Valley Range in Henderson with Rocky, Billy and Jeffrey, where Billy gave me instruction on firing his Ruger P95, a lightweight weapon which is probably a good starting point for someone as small as me. Billy ran me through a safety briefing and introduction to the P95, and demonstrated the firing of it. Then it was my go, under Billy’s careful watch and mentoring, and a light holding of my right shoulder while I got used to the kick of the gun. Here are a couple short videos of me shooting the P95. You can’t really see much of what I’m firing at, but you can see enough. And the targets. In this first one, the clump of shots which hit right on top of each other dead-centre in the target were Billy’s. The rest were mine. All good, but that shot in the arm was definitely a stray. And the 2nd target. All of these shots were mine. I definitely have a bias to the right (would you expect anything else from me?) but this could be corrected with practice. Still, for a first go, I was happy with the results. A very big thanks to Rocky, Billy and Jeffrey for the outing. It was a very enjoyable experience. It has been quite a while since I posted much of anything to this blog and I should probably explain why. 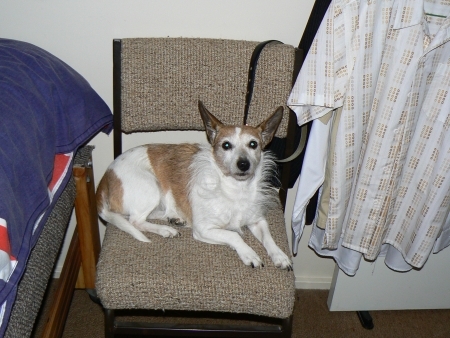 Shortly after I returned from Deniliquin following Paul Dix’s funeral, my dear old dog Nattie died. Nattie had been a little bit unwell for a little while prior to this, but I thought she was on the mend, so her passing came as more than a bit of a shock and at a time when I wasn’t really in the best state of mind to deal with it. Ever since then I have wanted to write a eulogy of some sort for Nattie, but have found it impossible to start. 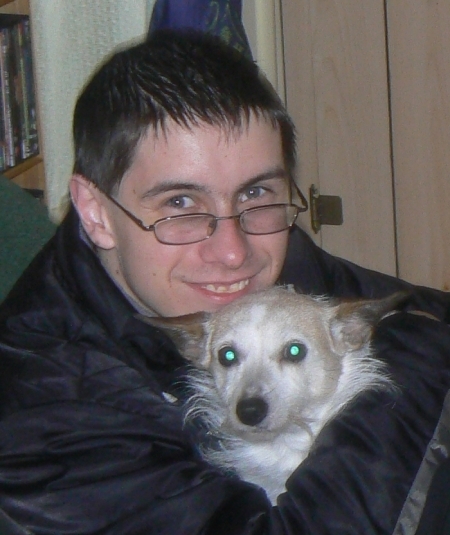 To some extent I have felt that by not writing it, I have kept part of Nattie alive and close to me, but of course as time has passed Nattie has not returned and I have started to feel a bit guilty about not writing Nattie’s eulogy sooner. Writing much else on here prior to Nattie’s eulogy seemed wrong, and it seems like the right time now to break this loop of inactivity. It is safe to say that Nattie’s passing has hit me quite a bit harder than I have been willing to admit. Nattie was a lovely dog. She was not my first pet as I had a caterpillar (Captain Caterpillar was his name) a couple years before I had Nattie, but she was my first dog. Captain Caterpillar sadly did not live and long-and-prosperous life as he was consumed by a parasite which is apparently commonly used in pest control to prevent caterpillars from reaching maturity and being able to reproduce. Nattie, thankfully did not face such a grizzly end, although it was quite clear that her final hours were not comfortable. Nattie joined my household in November 2000. At this stage Nattie was an adult dog and we believe she was close to a year-and-a-half old at the time. Originally we thought she was younger than that, but evidence eventually proved us wrong. Prior to coming to live with us, Nattie had been trained to be a companion dog for an elderly lady in Sydney…what exactly this entailed, we don’t know, but she would go berserk if anyone came to the front door and was more than happy to lie quietly on a lap for an extended period of time, much more so than Pebbles is, and so we suspect this was part of it. Unfortunately the elderly lady died, and Nattie was inherited by one of her nieces…a lady in the Canberra suburb of O’Connor. This lady already had two dogs who were much larger than Nattie, and with whom it seemed Nattie did not get along. The lady was worried about Nattie and eventually decided that the only solution was to sell Nattie so that she would have a chance at a better life elsewhere. We don’t know how much time had passed since the elderly lady in Sydney had passed away, but one Saturday her niece put a classified advertisement in The Canberra Times and we saw it. If memory serves, the lady was only asking $150 for Nattie as she was more concerned with making sure Nattie went to a good home than with making money out of her sale. I’m not entirely sure that it was $150…I think that’s right but it might have been a slightly different amount…I don’t fully recall as I was 13-years-old and the lady would not discuss financial transactions with a child. As it was a Saturday, it was cleaning day. Dad stayed at home to continue with the cleaning while Mum and I went to O’Connor to see the dog in the paper and see if she seemed like the right dog for us. I’ll never forget what happened when we got there. The other dogs weren’t interested in our arrival in the slightest, but this little dog ran over to the gate more excitedly than just about any other time I can think of and she pushed her nose through the wire gate and was licking us and sniffing us and was just generally excited to see us. It was as if she knew that we had come to rescue her. We bought her and took her home where she met Dad and befriended him quite quickly after a moment of apprehension when she first saw him. We suspect that she was mistreated a little bit by a man before we bought her as there were a few odd flinches and similar reactions from Nattie from time-to-time…their weirdest one of all was that she absolutely hated anyone touching any of her feet at first. We helped her grow out of that, but there was still the occasional sign of some mistreatment in her past. The main reason we thought she was younger than she was when we got her home (apart from the lady in O’Connor not knowing) was her weight. Nattie weighed only two kilograms when we got her. 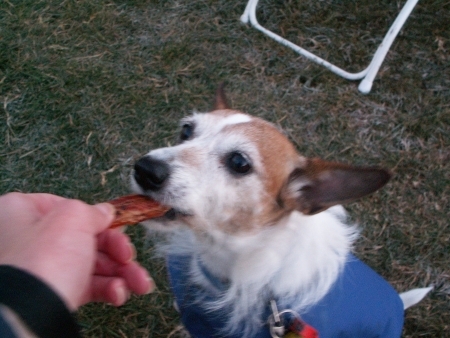 For an adult Jack Russell Terrier that is severely underweight. Eventually, with a good diet, she stabilised at about 6-7kg, although she was a fussy eater and would refuse almost every dog food in existence. With dry dog food she would eventually eat very small amounts of it and pick out the green bits and leave them on the floor, and for a little while she would eat Pal’s Little Champions, but only if the tin was freshly opened…no leftovers accepted. Her diet for most of her life consisted mostly of meats and small amounts of vegetables prepared at home in one way or another, and bones, which she seemed to enjoy. I should probably note that when we got Nattie, her name was Nellie. That happens to be the name of one of my aunties so it seemed like a bad idea to keep that way, so we changed it to Nattie, which became short for Natalie. Her full name was Natalie Darling Gordon-Stewart, although I did sometimes refer to her as “Nats”. When she was older I quite often called her “Natalie” as it seemed somewhat appropriate for a dog of a mature age. Nattie’s sleeping arrangements changed many times through her life. At first she slept with me. I remember her first night at home. I had just settled her down at the end of my bed and went over to turn on my clock radio as I always went to bed with the radio on…I pushed the button and the radio started to make some noise…it wasn’t very loud but it startled Nattie. She looked up at the radio with some alarm, the jumped off my bed and bolted downstairs. I had to turn the radio down a bit and coax her back upstairs…it took a few nights but she eventually got used to the radio. On another night Nattie took exception to the loud snoring coming from my parents’ room and tried to stop Dad from snoring. He awoke, somewhat startled, to a thing on his face and, thinking someone or something was trying to suffocate him, got up with a start and yelling, which had the effect of throwing Nattie half way across the room and scaring her to the point that she hid in the far corner under my bed. The first I knew of this was when Dad woke me up to ask me to get Nattie out from under my bed so that we could comfort her. It took some coaxing with some cheese to get her out…which incidentally is the same way we taught her to use the doggy door…but she came out and didn’t try that again. At one stage Nattie got in to the habit of barking at 6am. She would stand at the end of my bed and bark. Maybe she was trying to beat the alarm clock (which was set for 7am) or maybe she was awake and wanted to play…either way, that plus her gradual spreading out along the bed meant that her sleeping on my bed was no longer tenable. We moved her to under my bed, but she would get up too rapidly and bang her head on the bottom of my bed, so we moved her to her own bed downstairs, but the number of toilet-related events in the house increased and so Dad built Nattie a kennel for her to sleep in at night. The kennel was a large wooden box which was up on a bench and I think it might have been bolted to the wall…in it was Nattie’s normal bed consisting of a sheepskin in a pillowslip plus a blanket. The entrance to the box was covered with a towel to help minimise drafts and, in winter especially, keep the heat in. During winter, we would give Nattie a covered hot water bottle and place it under her sheepskin, to provide some extra warmth. On more than a few occasions we found that Nattie had been so comfortable in her bed of a night, that she had brought a bone in to the bed to chew on. Eventually, once we were confident that Nattie’s toilet training had resumed being of a satisfactory competency, we let her sleep inside again…at first with a cut down version of the box, and then a succession of other beds. Towards the end, Nattie’s bed was one of our old lounge chairs and eventually a converted lower-section of a wardrobe in my parents’ room. 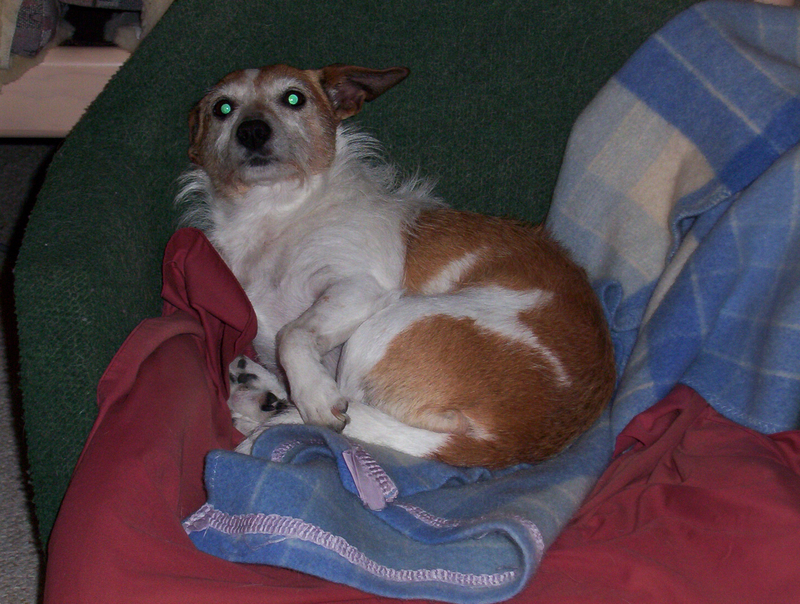 Nattie in one of her beds, circa 2005. Nattie loved her walks, and playing ball. She regularly wore the squeak out on any squeaky toy, and would squeak toys at people in a very cheeky and playful manner. When she was young we would regularly take her on long walks…she was apprehensive of metal light poles after one of the first long walks when she sniffed at one on Ainslie Avenue and got a static shock on her nose from the pole. 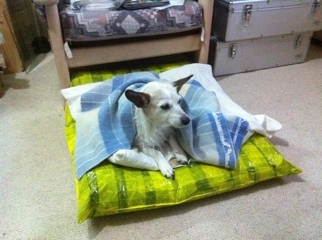 I also remember one of her other early walks in January 2001 when we took her up Mount Ainslie at dawn, stopping for water at such regular intervals that she would look at the water which we poured out for her as if she thought we had gone crazy for stopping for water yet again. After that walk, Nattie slept for a solid three hours, which was unheard of for her during daylight hours. We had to carry her half of the way home from another of the long walks when she, as she often did, accompanied us to BBC Hardware on Mort Street, Braddon, next to the telephone exchange…it was just a tad too far for her on that day (it was a warm day) and she stopped outside the old Ainslie Primary School and refused to move another inch. I took her to see the hot air balloons during the annual balloon fiesta on a few occasions. 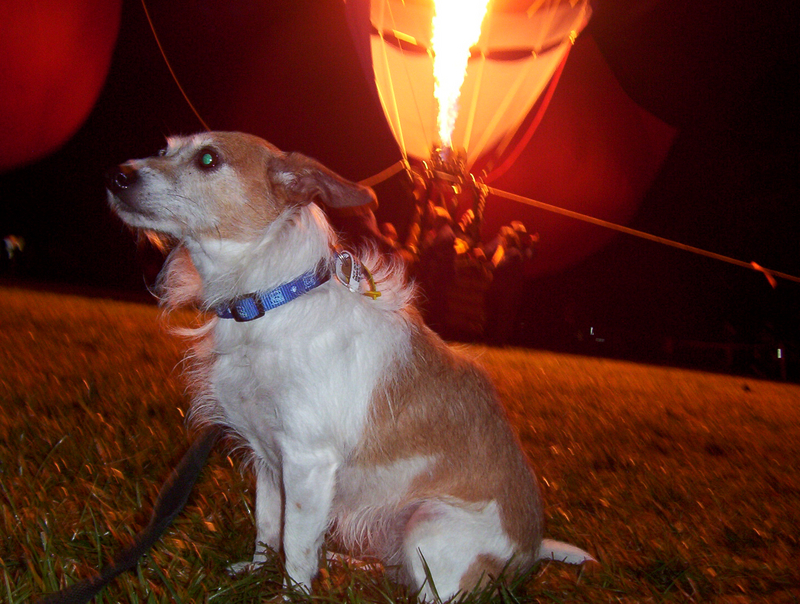 She wasn’t too keen on the hot air balloons, but enjoyed the bacon which was always being cooked there. For a while, every Sunday morning I would take Nattie for a walk in to Civic to the newsagency which was opposite the David Jones end of the Canberra Centre, where we would buy the newspaper and then, on our way back home, walk past the little round cafe where the people there were quite fond of Nattie and would give her some bacon. Early on in Nattie’s life, she hated the vacuum cleaner with a passion. She would bark at it and bite at it…of course we found this to be funny so we played on it a bit and it became a bit of a game. As time went by, Nattie’s dislike of the vacuum cleaner lessened, but she still enjoyed playing a game of “attack the vacuum monster” if we started using it around her in a playful manner. One day I was using the vacuum cleaner in reverse to get compressed air for a dust-removal task…Nattie came outside to see what I was doing and left quickly when I blew a bit of air on her…I suppose she didn’t like the Vacuum Monster blowing warm air on her. “Oh goodness, it used to try to eat me…now it’s trying to cook me” she might have thought…later she took that as a game as well. The hair dryer was originally not on her list of favoured things, probably because it only came out after the dreaded bath and was the subject of guilt by association. 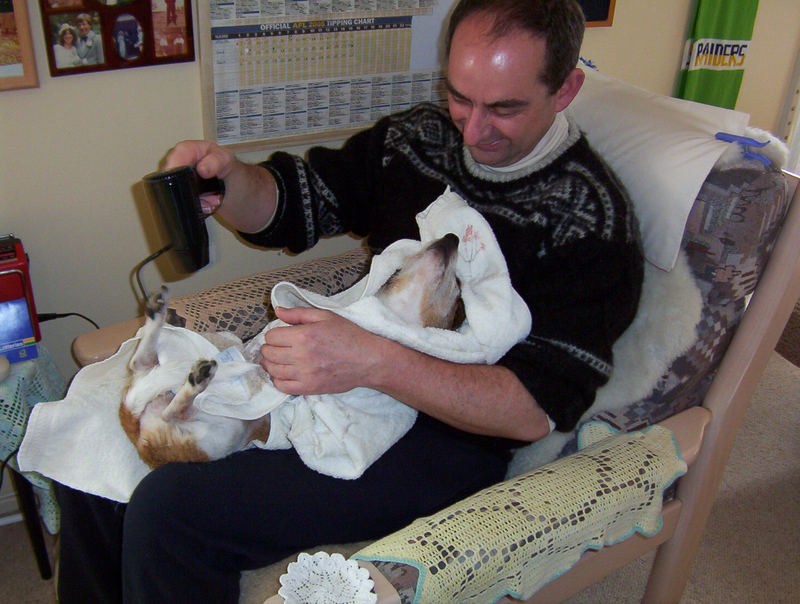 While Nattie never started to like the bath and would do her best to avoid it, she did enjoy the drying off afterwards and came to enjoy the hair dryer being part of that process, and the ball game which inevitably followed to get her to run around a bit to also help dry her off. Nattie got greyer as time went on. Her dark tan sections of her coat started to grey around the muzzle first, before extending to the rest of her head and the remainder of her coat. Her three tan dots above her thigh on her right side were among the last parts to remain a tan colour. 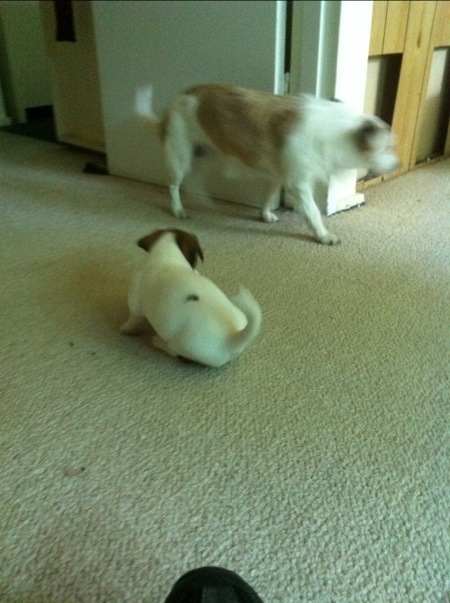 In November of 2011, we added another dog to the household, a little puppy named Pebbles. Prior to this, Nattie had been slowing down quite a bit, as could be expected of a senior citizen, and seemed to be going through the motions a bit when it came to activities such as ball games…she seemed to be participating in some of these things more because we enjoyed it and less because she enjoyed it. We got Pebbles because we thought Nattie could use a companion in her older years…Nattie might not have seen it that way at first though…the very first moment our backs were turned, Nattie made a point about making sure Pebbles knew who was boss. There were no injuries, but Pebbles probably got the point when she was shown teeth that were about as big as her head. It took a little while, but Pebbles and Nattie seemed to get on reasonably well after a while. Pebbles was clearly more attached to Nattie than Nattie was to Pebbles, but Nattie seemed quite happy to relinquish ball-chasing duties to Pebbles, and they would sleep together fairly comfortably on many occasions. Nattie did occasionally join in a game with Pebbles, but generally found it too tiring to stay in the game for long. This video shows me playing ball with Pebbles, and Nattie joining in for a little while. 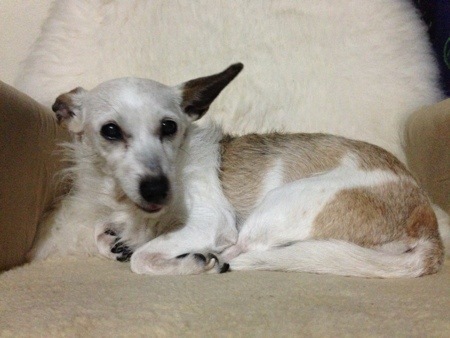 When we got Pebbles, Nattie was already showing signs of advancing arthritis in the rear legs, in addition to her eyesight being slowly eroded by cataracts. Despite this, if we went for a walk up to the Campbell High School oval and let them off for a run, Nattie was more than happy to join in and quite enjoyed it, even if for her it was more of a meander than a run. Unfortunately the trouble for Nattie seemed to set in late in 2012. I remember when she had her annual injection in November 2012 that I raised with the vet that there seemed to be an increased amount of noise when she snored, and that she could really have tummy rubs much any more because it would induce a snorting, in a manner similar to the shortness of breath she used to experience when she was young. The vet wasn’t too concerned at the time, and said we should keep an eye on it…it wasn’t particularly uncommon but if it got worse, it might be necessary to drain some fluid. Over the following year, Nattie’s willingness to go for walks reduced and she found it difficult to walk very far. Given her arthritis and age, this wasn’t a big concern either. Overall, Nattie just seemed to be ageing. If my eyesight was failing and I had arthritis in my leg joints, I probably wouldn’t want to walk all that far either. In late August of this year, Nattie’s increased noise while snoring got worse, and expanded to her everyday breathing. Her breathing seemed to become quite laboured and her energy levels dropped markedly. I took her up to see the vet (Peter, her original vet, had returned to the practice after a period of semi-retirement) and he was concerned by what he observed. There were a number of possibilities as to the cause of her condition, the most likely of which was a hayfever-like allergic reaction…Nattie had suffered from them before and it was the only possibility which was treatable. Peter gave her a cortisone shot which was supposed to last a few days, with the idea being that if it was an allergic reaction, then cortisone should reduce the swelling and therefore help with her breathing. It worked, so Peter gave her a longer-lasting shot to hopefully ride out the time in which the allergen was present. It seemed to work…Nattie was much more active and her breathing was quiet. Before I went to Deniliquin on the Wednesday for Paul Dix’s funeral, Nattie seemed reasonably well. There was a small amount of noise in her snoring, but nothing more than had been there a month prior. It was, if memory serves, the third week of the longer-lasting shot and it should have had another week to run, so to say I was stunned when I got back home late on the Thursday and found that Nattie was now worse than before I left would be an understatement. According to Mum and Dad, the relapse had happened in the space of a few hours on the Thursday. The cortisone should have still been working if it was all down to an allergic reaction. We all knew this meant that there was almost certainly something more serious happening, but we didn’t say it. On the Friday, Nattie was clearly quite uncomfortable…her breathing was very laboured and she was extremely sluggish. Mum and I both took her up to see Peter (Dad had to work) and he was very concerned…he explained the situation, explaining how it seemed that a tumour was most-probably blocking her airway and that the only way to really know for sure how bad it was and whether it was operable would be to give Nattie a general anaesthetic which, due to her age and her breathing difficulties, he was hesitant to do because her chances of survival were negligible from such a procedure. He gave her a booster shot of cortisone to try and reduce the swelling a bit and, without saying it in so many words, effectively told us that it wouldn’t solve the problem, but would make Nattie a tad more comfortable for a short time and would give us time to discuss what we wanted to do and maybe even seek a second opinion if we so desired. Dad was on a late shift that night…I think he came home for dinner but I can’t really recall. I seem to recall that we discussed taking her in to see Peter first thing in the morning, but I don’t recall if that was in person or over the phone. What I remember is that, at first, the shot did help Nattie sleep a bit easier. She was still clearly very unwell, but at least she wasn’t struggling for breath all the time. Peter had informed us that he would be available by phone during the evening if we needed to talk as he had some late work to do at the surgery. As the night went on, Nattie’s breathing got worse again. We did out best to comfort her, but it was a very difficult night as we helplessly watched on as she would repeatedly manage to doze off, only for her breathing to slow and for her to wake up with a start to try and catch her breath. It was as torturous for us as I’m sure the experience must have been for Nattie. Pebbles had showing concern for Nattie for quite some time, and was quite agitated on this night by the state of Nattie’s breathing. It was nice to see Pebbles trying to look after Nattie, but difficult at the same time to try and keep Pebbles calm as she seemed to be a bit distressed about Nattie. I recall calling Peter at one stage during the evening, around 8:00 or 8:30, and him saying that he would call us back after 10:30 to see how Nattie was at that stage. In the meantime I believe he was dealing with a dog which had a broken leg. Dad got home from work around 11pm and it was very noticeable how much worse Nattie had gotten in just a few hours. Peter hadn’t called, and so I tried a few times over the course of the hour. We figured that he may have gone home after the surgery, which would have been quite reasonable considering that he opens again at 9am on a Saturday, and we decided that we would stay up with Nattie all night…we knew that we didn’t really have a choice and we were going to have to put Nattie down, and thought we would stay up with her through the night, and take her up to see Peter in the morning. Well, just after midnight I decided to try Peter’s surgery number one more time…so my surprise the receptionist/nurse answered…they had just finished operating on the dog with the broken leg. Peter was concerned about Nattie and asked us to come up and see him right away. We were a bit hesitant, partially out of concern for Peter given how long he’d been working, and partially out of not really wanting to let Nattie go, but Nattie was very unwell so we agreed. Pebbles was concerned when we left with Nattie…we took Nattie up in a box with her favourite blanket in it as this seemed like the best way to keep her comfortable on the journey, and Peter and his assistant met us in the waiting room. I put Nattie on one of the chairs in the waiting room and we all kept her company while Peter examined her…it was very nice of Peter to see Nattie in the waiting room as this didn’t stress her out in the way the yellow table of the examination room would have. 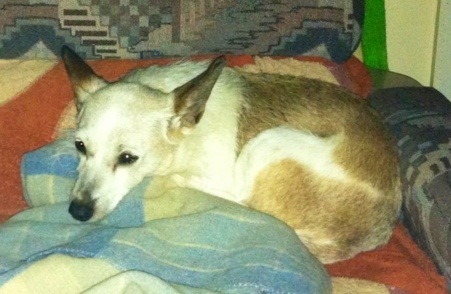 Unfortunately Nattie was in very bad shape and we had to put her down. Nattie stayed on the chair the whole time. We all took a few moments to say goodbye to her. I stayed with her, patting her and talking to her, and generally keeping her company, while Mum and Dad were standing behind me. I was holding Nattie as Peter gave her the injection…I was amazed at how quickly it took effect and reduced to a tearful wreck at the same time. 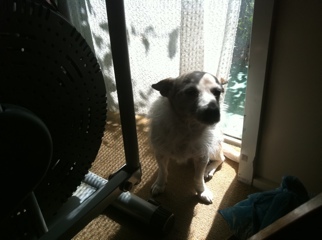 My lovely old dog was gone, and it was awful…utterly awful. Peter’s assistant got us all a cup of tea…I can’t say that I drank much of the tea. We were all very upset, and Peter did his best to help us with our grief. I remember having a chat with him…I remember some of his words of wisdom…not all of them, but I do remember him saying at some stage that he didn’t think Nattie would have made it through the night and it was probably for the best for all of us that we had the opportunity to say goodbye. It was comforting having Peter there, and I think, in a way, although Nattie did like to try to bite Peter whenever the chance arose, there seemed to be a mutual respect between them, and I think Nattie would be glad that Peter was her doctor at the end. We took Nattie home. It was very sombre. We let Pebbles see Nattie and she seemed to be relieved…the tension that Pebbles had been exhibiting all night was gone…whether she realised Nattie was gone or whether she just saw that Nattie wasn’t having breathing difficulties, I don’t know. Nattie stayed in her box in the laundry for about half the day, and I think we all visited her a couple times during the day. By early-mid afternoon Dad finished building her a little wooden coffin. We buried Nattie in the backyard with a sheepskin and her favourite blanket, not far from the aviary, which Nattie seemed to like to look at. I miss Nattie. I miss her cheeky and sneaky ways of obtaining food (or hiding food). I miss her curling up on my lap or taking up half of my chair when she wanted to lie down next to me. I miss her excitement, no matter how little distance she could cover, whenever I picked up the lead or said “walkies”. I miss how happy she was when I would come home and how, in her older years, she might sleep through my arrival and wake up a little later and still be excited to see me. I miss the waddling walk she would do, as well as her busy walk. I miss how she seemed to walk sideways when she was on the leash. I miss my chats with her. Basically, I just miss her. She was lovely. But I’m also glad that she isn’t suffering any more. I had almost thirteen years with Nattie, and I dare say that thanks to Peter Burgess’ veterinary work, I probably had a few more weeks with her than I might otherwise have had. I will always be thankful for the time I had with Nattie. May she rest in peace. Soon, we think, we will consider getting another puppy. Not to replace Nattie, but to help keep Pebbles company, and to add a bit more lovable chaos to our lives. It took Pebbles a little while to get over Nattie, and she was very upset when we buried Nattie, and while she has settled down now, it seems that she could benefit from some doggy company…she needs a playmate. So, thank you for everything Nattie. I couldn’t ask for a more wonderful companion, and I wouldn’t try. Thank you. Today is a very exciting day for me because tonight, at 7 o’clock, I will be attending The Seekers’ concert here in Canberra. When I was a child there were a few bands which I particularly liked and wanted to see in-person one day, although I didn’t really understand that many of the songs I was hearing were a good thirty or forty years old. There are a few bands and singers who are still on that list, but The Seekers have always been right up there at or near the top. I could barely contain my excitement when I found out last year that they were coming to Canberra, and I snapped up tickets as quickly as I could. Months have passed and the entry on my calendar has drawn nearer, and finally it is here. I’m looking forward to a wonderful evening, and there are many songs which I am looking forward to hearing. These are but two of them. And although I’m not expecting it, at the 1994 AFL Grand Final they performed a few songs which they wouldn’t normally perform (and Georgy Girl which they do normally perform) and it would be lovely to hear one or two of them. It would be particularly lovely to hear them sing the national anthem as they sing it with a level of dignity and respect which is wonderful and rare, but I don’t imagine that it will happen. I am looking forward to seeing Mary Kissel, a member of The Wall Street Journal’s editorial board, addressing The National Press Club this afternoon. Mary usually writes very insightful pieces on things happening in the Asia-Pacific region, as well as in the United States. One piece in particular stands out in my mind and will, I hope, act as a preview for her address today. Liberal attacks on the tea party are nothing new, except when they come from a cabinet member of an allied nation—in this case, Australia. In a speech Friday in Sydney, Labor Party Treasurer Wayne Swan said “the biggest threat to the world’s biggest economy are the cranks and crazies that have taken over a part of the Republican Party.” Mr. Swan, like many Democrats, just wants to spend more taxpayer monies. I am very much looking forward to being in attendance for Mary’s speech this afternoon, and I am hopeful that some of you may decide to watch what will, I’m sure, be a very interesting speech, live on ABC News 24 from 12:30pm (it is always nice and unusual to find something as interesting as this on ABC News 24, so that alone makes it worth tuning in). If I get a moment, I may try to post a photo from there as the speech gets underway, but that will depend entirely on whether it seems appropriate. Today is Pebbles’ first birthday. It is really quite hard to believe that almost a whole year has gone by since Pebbles came to stay. She was six weeks old when she arrived and made herself at home, and found that Nattie was very keen to make it known that the new dog would not be of a higher rank than her. Since Pebbles’ arrival, Nattie has grown to like Pebbles quite a lot, although probably not quite as much as Pebbles likes Nattie. To say Pebbles is fond of Nattie would be a serious understatement. Nattie also seems to be happier and more active since Pebbles arrived and quite gladly joins in on ball games. I filmed this last night as Pebbles wanted to play ball on the stairs and Nattie joined me at the bottom of the stairs where she tried to catch the balls as they came back to me. Nattie doesn’t like to run up and down the stairs like a crazy dog these days, but when I invited her up the stairs, she was very quick to find a loose ball to take back to her chair and chew on. My apologies for the video being a little bit out of focus. A very happy first birthday to Pebbles! And a thank you to 2UE’s John Kerr who wished Pebbles a happy birthday on the radio at about 2:30 this morning. In case you don’t already know, I’m up in Sydney today to see Tony Abbott deliver an address to the Institute of Public Affairs on the topic of freedom of speech. I’m led to believe he has an announcement to make. 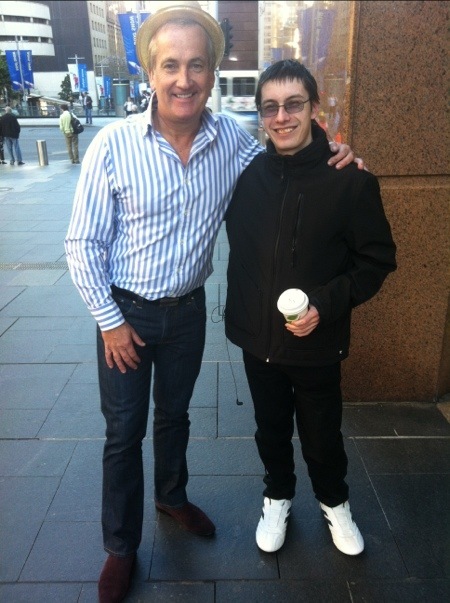 As I have a bit of time while I’m up here, I decided to drop by the Seven Network studios at Martin Place and do something I’ve wanted to do for a long time…say hello to Glenn Wheeler in person as it has been far too long since I last did that. Glenn was kind enough to spare a moment of his busy schedule…so I’m pleased to be able to present the one, the only, the great, and the incredibly psychic (or psycho, depending on which promo you listen to) (drum roll….) Glenn Wheeler! (I couldn’t afford his studio audience, so you’ll just have to imagine the applause). Thanks Glenn! Good to see you again. Congratulations and many happy returns today to Nattie, who celebrates her 84th birthday (12 to us humans). The majestic older Puppy-Dog-In-Charge has started her day in a leisurely manner, and I expect that she will spend the rest of the day in much the same way. Every few days Nattie and Pebbles go for a run in the afternoon instead of a walk. Usually they are taken up to the front oval of Campbell High School which is usually pretty quiet in the afternoon, especially in comparison to Reid Oval across the road, which is used by every football and cricket player, and every dog in the neighbourhood. It also has the benefit of tiring them out, so that they want to have a sleep for a few hours when they get home. This is especially useful when it comes to Pebbles as she can be quite exhausting with seemingly near-endless amount of energy. Anyway, while Nattie and Pebbles were having their run this afternoon, I filmed some of their activities. Enjoy!